Fabio is a passionate student in web tehnologies including front-end (HTML/CSS) and web design. He likes exploring as much as possible about the world wide web and how it can be more productive for us all. Currently he studies Computer Engineering, at the same time he works as a freelancer on both web programming and graphic design. The aim of this article is to provide a wide range of questions that a web developer can be asked during a job interview. Preparing for a job interview can be a daunting process if the scope of what is to be asked is so large. Web development includes a considerable set of skills and langauges, and an interview of this scale is sure to be all inclusive regarding the various web technologies. However, as long as the focus is not on any specific langauges (which is not common for today’s programmer hiring), questions are expected to be general and explore the most important concepts of the main languages/technologies used in the web as well as personal best practices of the candidate. Web developers are responsible for managing the way content appears to the users on a particular website. The field includes working with programming languages to create web applications that combine databases and other tools to create company’s web managment systems. However, apart from the complex part, it can also be about creating static pages and designing stuff. As big data is more and more part of systems, its manipulation and maintenance may as well come with errors, which then will have to be debugged by members of the web development team in companies. In a general viewpoint, web developers are the ones who work behind the scenes to provide not just sites, but services people use everyday. While there are a lot to be asked in such interviews, let us have a look at what most of these questions might be. 1. How would you use persistent storage on browsers? What options would you use? For HTML browsers, a good choice would be local storage and persistent storage. For non-HTML ones, cookies are the best bet. W3C stands for World Wide Web Consortium which is the international standard for World Wide Web. W3C is constantly busy trying to standardize the web and to make it accessible to all users. The company was created in 1994. 3. What are two common ways in which you can reduce the load time of a web application? 4. What is graceful degradation? Graceful degradation refers to the property that enables a system to function properly even in the event of failure of either the system or a component of it. DTD stands for Document Type Declaration and it tells the browser which version of either HTML or XHTML is being used. 6. What is the difference between “Web development” and “Web design”. Web development includes a lot of processes, and Web Design is part of it. Web design is used to represent page layouts and graphical user interface. Web development is a wider term to mean planning, coding, testing, debugging etc. 7. What is CORS? How does it work? Cross-origin resource sharing (CORS) is a mechanism that allows many restricted resources (e.g. fonts, js etc.) on a web page to be requested from another domain outside the domain from which the resource originated. It’s a mechanism supported in HTML5 that manages XMLHttpRequest access to a domain different. 8. Describe the key advantages of HTTP/2 as compared with HTTP 1.1. An important operational benefit of HTTP/2 is that it avoids the head-of-line blocking problem in HTTP 1. 9. How do you optimize a website’s assets? There are several ways to do this, for example: file concatenation, file compression, CDN Hosting, offloading assets, refining code etc. 10. What web browser do you use? Because web developers should be familiar with all browsers in terms of testing their web projects the best answer here is: All of them. 11. What’s the difference between standards mode and quirks mode? Quirks mode is a default compatibility mode and may be different from browser to browser, which may result to a lack of consistency in appearance from browser to browser. 12. Explain what is long polling? Long polling is a web application development pattern used to emulate pushing data from the server to the client. With long polling, the client requests information from the server in a similar way to a normal poll. However, if the server does not have any information available for the client, instead of sending an empty response, the server holds the request and waits for some information to be available. HTML stands for HyperText Markup Language. It is the most popular markup language for creating websites that can be viewed in a web browser. 14. What is the difference between HTML elements and tags? HTML elements communicate to the browser how to render text. When surrounded by angular brackets <> they form HTML tags, which come in pairs and surround text. 15. What does DOCTYPE mean? The term DOCTYPE means Document Type Definition and tells the browser which type of HTML is used on a webpage. Browsers use DOCTYPE to determine how to render a page. Failing to use DOCTYPE will load your page in Quirks Mode. 16. What are the limitations when serving XHTML pages? The main limitation is the poor browser support of XHTML. Internet Explorer and other user agents cannot parse XHTML as XML. Thus, it is not that extensible language as one might think. 17. What is the syntax difference between a bulleted list and numbered list? Bulleted lists use the <ul> tag, which stands for “unordered,” whereas <ol> is used to create an ordered list. 18. What is the difference between a <div> and a <frame>? A <div> is a container element for grouping and styling, whereas a <frame> creates divisions within a web page and should be used within the <frameset> tag. The use of <frame> and <frameset> are no longer popular and are now being replaced with the more flexible <iframe>, which has become popular for embedding elements from other websites (ie. Youtube videos) into a page. 19. What is the difference between the application model of HTML and HTML5? There is not a big difference between the two. HTML5 is a continuum of HTML. There has been no major paradigm shift. From a broader viewpoint, HTML was a simple language for laying out text and images on a webpage, whereas HTML5 can be viewed as a development platform that does what HTML does that and more, including better support for audio, video, and interactive graphics. It has a number of new elements, supports offline data storage for applications, and has more robust exchange protocols. 20. What are some new HTML5 markup elements? Among several: <article>, <aside>, <bdi>, <command>, <details>, <figure>, <figcaption>, <summary>, <header>, <footer>, <hgroup>, <mark>, <meter>, <nav>, <progress>, <ruby>, <rt>, <section> and <time>. 21. What are the new image elements in HTML5? The new image elements in HTML5 are Canvas and WebGL. <canvas> is a new element that acts as a container for graphical elements like images and graphics. WebGL stands for Web Graphics Language, a free cross-platform API that is used for creating 3D graphics in web browsers. 22. What are data- attributes good for? 23. Describe the difference between cookies, sessionStorage, and localStorage. Cookies are small text files that websites place in a browser for tracking or login purposes, and hold a modest amount of data. Meanwhile, localStorage and sessionStorage are new objects, both of which are storage specifications but vary in scope and duration. Local storage is more secure, and large amounts of data can be stored locally, without affecting website performance. Futhermore, is it permanent. sessionStorage only lasts as long as the duration of the longest open tab. 24. What are some of the major new API’s that come standard with HTML5? Among others: Media API, Text Track API, Application Cache API, User Interaction, Data Transfer API, Command API, and the History API. 25. What is the difference in caching between HTML5 and the old version of HTML? 26. What is image map? An image map is a list of coordinates relating to a specific image, created in order to hyperlink areas of the image to different destinations (as opposed to a normal image link, in which the entire area of the image links to a single destination). 27. What is the advantage of collapsing white space? White spaces are blank sequences of space characters, which is actually treated as a single space character in HTML. The browser collapses multiple space into a single space, so we can indent lines of text without worrying about multiple spaces. This enables us to organize the code into a much more readable format. 28. Do all HTML elements need both opening and closing tags? Not really, elements like <img src=""/> or <input type=""/> don’t need a closing tag. 29. What is a marquee? A marquee is used to enable scrolling text in a web page. To do this, just place whatever text you want to appear scrolling within the <marquee> and </marquee> tags. 30. How do you create links to sections within the same page? somewhere on the same webpage so that the user will be linked to that place when clicking on “BACK TO TOP”. 31. What are the possible ways to apply CSS styles to a web page? 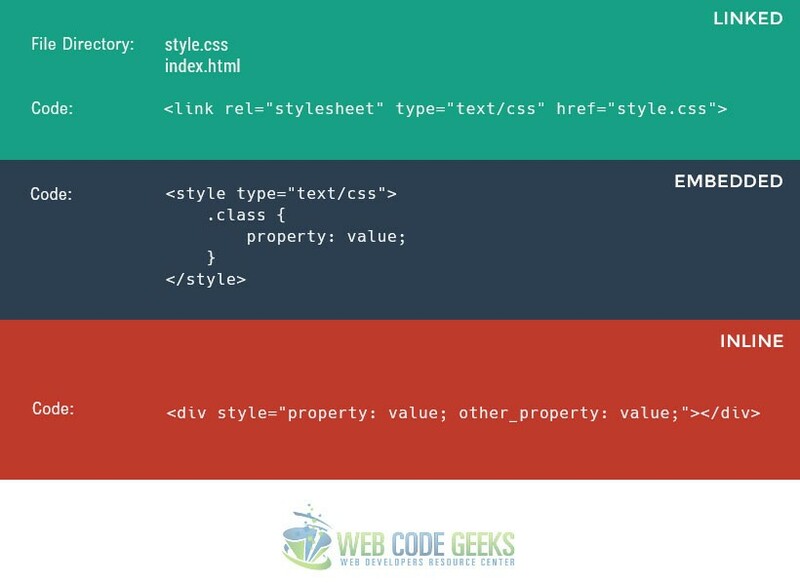 Embedded: Inside the HTML document, open a style tag and inside that, add all styles just like you’d do on a linked file. Inline: This is done by adding a style attribute inside an HTML element. 32. 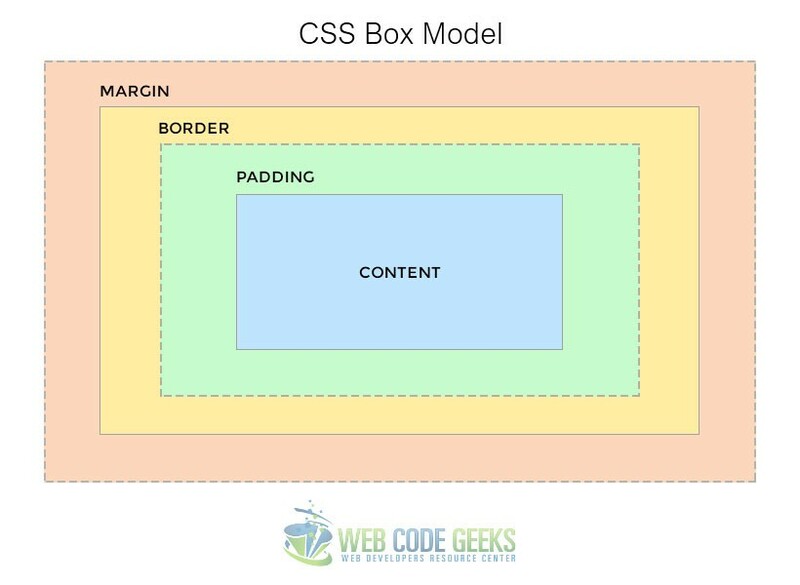 Explain the CSS box model. 33. What is the difference between inline and block elements? Basically, a block element will take up the whole width available, and comes with a line break before and after. Examples of block level elements are: headings (i.e <h1>), paragraphs (<p>), divisions (<div>) etc. In contrast, inline elements take up only the space they need, and do not force line breaks. Examples of inline elements are: anchors (<a>), spans (<span>) etc. 34. What is grouping used for in CSS? 35. What is a Class selector and how does it differ from an ID selector? The difference between classes and ID’s is that a HTML element can accept multiple classes, but only one ID. That means ID’s are unique for HTML elements. 36. What is the difference between visibility:hidden and display:none? visibility:hidden hides the element, but it will still takes up space, this way affecting the layout of the document. display:none also hides the element, but will not take up space and the page will appear as if the element is not present. 37. What are CSS preprocessors and why do we use them? However, there are also some disadvantages like updating issues and debugging difficulties. 38. What are child selectors in CSS? 39. What are grid systems and why do we use them in web pages? Grid systems are structured rules that enable content to be stacked horizontally and vertically in a consistent and sustainable way. They find heavily usage in today’s websites because they offer increased producitvity while coding, they’re versatile and ideal for responsive layouts. 40. How do we use shorthand properties and why? 41. What is the purpose of the z-index and how is it used? Auto: Sets the stack order equal to its parents. Number: Orders the stack order. Initial: Sets this property to its default value (0). Inherit: Inherits this property from its parent element. 42. List some of the new CSS propertied introduced with CSS3? Also, other features like multiple backrounds which allows you to have two or more background in the very same selector and flexible box model which ensures that elements behave predictably when the page layout must accommodate different screen sizes and different display devices. 43. Explain what pseudo-classes are and their usage. 44. What is the CSS selector which allows you to target every element in a web page? 45. What are media queries and how are they used? this is used to refer to the current object in the code. In the global execution context (outside of any function), this refers to the global object, whether in strict mode or not. 50. What is event delegation and how does it work? Event delegation allows us to avoid adding event listeners to specific nodes of the DOM; instead, the event listener is added to one parent. Using event delegation it’s possible to add an event handler to an element, wait for an event to bubble up from a child element and easily determine from which element the event originated. 51. What is the difference between window.onload and onDocumentReady? The window.onload event will not trigger until every single element on the page has been fully loaded, including CSS, images and/or other assets. The main disadvantage is that it might take a while before any code is actually executed. On the other hand, onDocumentReady executes code as soon as DOM is loaded. An anonymous function is a function declared without any named identifier and in general, is not accessible after its declaration. 54. Explain the role of break and continue statements. 55. How are object properties assigned in JS? Similar to the way a value is assigned to a variable, we assign object properties like this for example: document.form.action="submit"
56. What is the difference between undeclared and undefined variables? Undeclared variables are variables that do not exist in a program and are not declared. If the program tries to read the value of an undeclared variable, then a runtime error is generated. Undefined variables are variables that are declared in the program but have not been given any value. If the program tries to read the value of an undefined variable, an undefined value is returned. 57. What would be the result of 5+2+”3″? Since 5 and 2 are integers (data type) they will be added together numerically. And since “3” is a string, the result would be a concatination, meaning 73. Namespacing is used for grouping functions, variables etc. under a unique name. It is a name that has been attached to the desired functions, objects and properties. This enables code reuse and improves modularity in the coding. wcg() creates a local variable name and then a function called displayMessage(). displayMessage() is an inner function that is defined inside wcg() and is only available within the body of that function.displayMessage() has no local variables of its own, however it has access to the variables of outer functions and so can use the variable name declared in the parent function. 62. What is $() in jQuery? The $() function is an alias of jQuery() function. $() function is used to wrap any object into jQuery object, which then allows you to call various method defined in the jQuery object. 63. What are jQuery events? Events are actions performed on specific conditions.. When we perform these actions on an HTML page, we can do whatever we want. We then use event handlers to perform the action. Some important handlers are for example: bind(), unbind(), blur(), off(), hover(), on(), one(), ready(),trigger() etc. 64. What is called chaining? Chaining is used to connect multiple events and functions in a selector. It means specifying multiple functions and/or selectors to an element. 65. What is the difference between event.PreventDefault and event.stopPropagation? In short, preventDefault(): Stops the default action of an element from happening. event.stopPropagation(): Prevents the event from bubbling up the DOM tree, thus preventing any parent handlers from being notified of the event. 66. How can we hide an image on a button click using jQuery? 67. What is AJAX in jQuery? $.ajax() – Performs an async AJAX request. $.get() – Loads data from a server using an AJAX HTTP GET request. $.post() – Loads data from a server using an AJAX HTTP POST request. 68. What Is the Format of an AJAX Request? 69. How can you find out that an AJAX request has been completed? We can use the ReadyState property to check whether AJAX request has been completed. If the property is equal to 4, the request has been completed and data is now available. 70. Do AJAX requests retain PHP session info, when calling multiple times? Yes, PHP retains the session info over multiple ajax calls. The duration of the php session depends on SESSION configuration. 71. How can a file be included to a PHP page? 72. What is the difference between ‘echo’ and ‘print’ in PHP? 73. What is a final class? What about a final method? A final class means this class cannot be extended. A final method means it cannot be overrided. 74. How can we create a session in PHP? How do we set and unset values in sessions? 75. How would you connect to MySQL database from a PHP script? 76. What are the main differences between GET, POST and REQUEST methods? GET and POST are used to send information from client browser to web server. In case of GET the information is send via GET method in name/value pair and is URL encoded. The default GET has a limit of 512 characters. The POST method transfers the information via HTTP Headers. The POST method does not have any restriction in data size to be sent. POST is used for sending data securely and ASCII and binary type’s data. The $_REQUEST contains the content of both $_GET, $_POST and $_COOKIE. 77. How can we find the length of a string in PHP? What about the length of an array? PHP provides the strlen() function to find the length of a string and count() function for finding the array length. 78. What is an associative array? 79. Can we send e-mail using PHP? How? 80. How is a constant defined in PHP? 81. What encryption techniques are there in PHP? 82. Is it possible to extend the execution time of a PHP script? Yes, that can be achieved using the set_time_limit(int seconds) which enables us to extend the execution time of a php script. Note that the default limit is 30 seconds. 83. What is the use of header() function in PHP? The header() function sends a raw HTTP header to a client browser. This function must be called before sending the actual output. 84. How is the ternary conditional operator used in PHP? Three expressions go into this kind of assignment, the condition and two operands describing what should be executed when the condition is true or false. 85. How can we create a text file using PHP? After writing or reading from file, we can close the file. You can also ask what’s expected of you in the interview. In most cases interviewers will give you a direct response so that you know how to prepare. Would like to share the more interviews questions, Undoubtedly, these are the slightly basic stuff. I need PHP MySQL questions for the intermediate designation. Mostly, it is also a fact that interview was given to the website design and development companies like https://www.branex.com/ has always remained a complicated task for the web designers.